The Gens lost two straight at home against the Peterborough Petes and the Hamilton Bulldogs over the weekend. 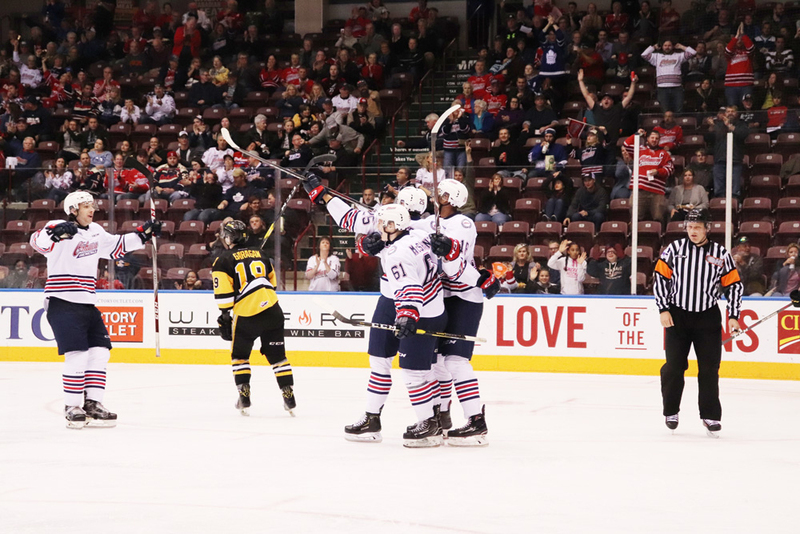 In the first period of Sunday’s game against the Bulldogs, the Gens did not come out of the gate strong, as they allowed two goals and scored none in the first period. The first goal came only 53 seconds into the game. The second period was a different story, as the Gens allowed three goals, but were also able to match that, scoring three themselves. The first Gens goal of the second came from Nando Eggenberger, his second of the season. Serron Noel and William Ennis assisted him. After allowing two more goals, Nick Wong scored his second goal of the season on the powerplay. He received assists from Kyle MacLean and Matt Brassard on the play. Nico Gross would then score his first goal of the season with assists from Noel and Jack Studnicka. Goaltender Kyle Keyser was pulled during the second and replaced by Cole Ceci in net. The score was 5-3 in favour of the Bulldogs at the end of the period. Only 3:46 into the third, Eggenberger scored his second goal of the game, bringing the Gens within one of the Bulldogs. He was assisted by Allan McShane. Mitchell Brewer would then tie it up 5-5 to complete the comeback. MacLean and Eric Henderson received assists on the play. The game then went into overtime, where the Generals came out hard and had multiple scoring changes. But in the end, Arthur Kaliyev scored the game-winning goal for the Bulldogs. Friday’s game against the Petes was a differet story as the Gens lost that game 2-1. Defensively, the Gens performed well, allowing only two goals on 25 shots, but they were stonewalled by Petes goalie Hunter Jones, who allowed only one goal on 46 shots. The lone goal for the Gens came in the first period and was scored by Allan McShane, his third of the season. Eggenberger and Wong assisted him. They would finish the first period against the Petes tied 1-1. In the second, Declan Chisolm scored his first goal of the season for the Petes to give them the lead. The score would not change from there and was 2-1 in favour of the Petes. The Gens will attempt to end their three game losing streak on Oct. 18 against the Petes and Peterborough at 7:05 p.m.